Not many people know this, but I gave up all alcohol from April 2011 until July 2013 for medical reasons (pregnancy then a growth in my liver). So, I became quite enthusiastic about non-alcoholic cocktails. Even now, most days I prefer them to their alcoholic counterparts. Perhaps it is because to compensate for the lack of alcohol, imagination comes into play and, often, with delicious results. One of my favourites was my Faux-jito, but now I’m adding my Old Bay Virgin Mary to that list. I do not have any experience as a bartender (not even making drinks for friends at a college party), so this is just how I make mine and is by no means an official IBA recipe. 1. In a tall highball glass, or whatever you have handy, sprinkle Old Bay, celery salt, and pepper. 2. Pour the tomato juice, lemon juice, Worcestershire sauce, and Tabasco over the dry ingredients and stir. 3. 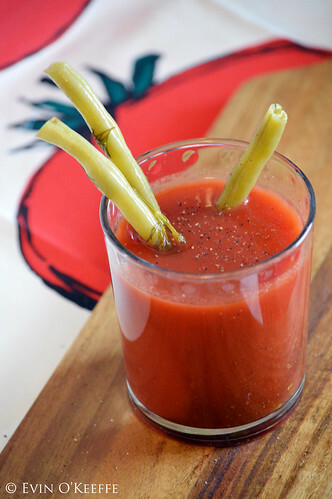 Garnish with a tall spicy pickled string bean (to use as stirrer) and lemon wedge (optional). Sprinkle a little freshly ground black pepper on top and serve immediately. You may have heard of or seen a salad in a glass version of a Bloody Mary and I must admit I admire them greatly. The addition of a tiny bit of cocktail sauce and a chilled shrimp dangling over the edge is quite a sweet addition. Or perhaps a crispy slice of bacon! 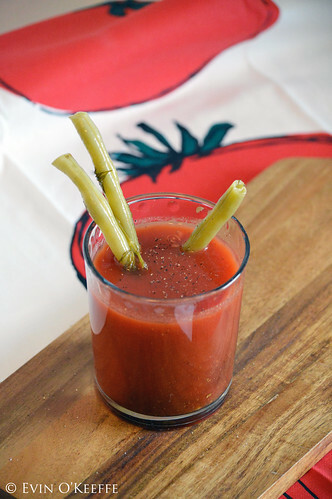 For such variations or to create your own Bloody Mary Bar for a party, I recommend this piece from Foodie Crush. 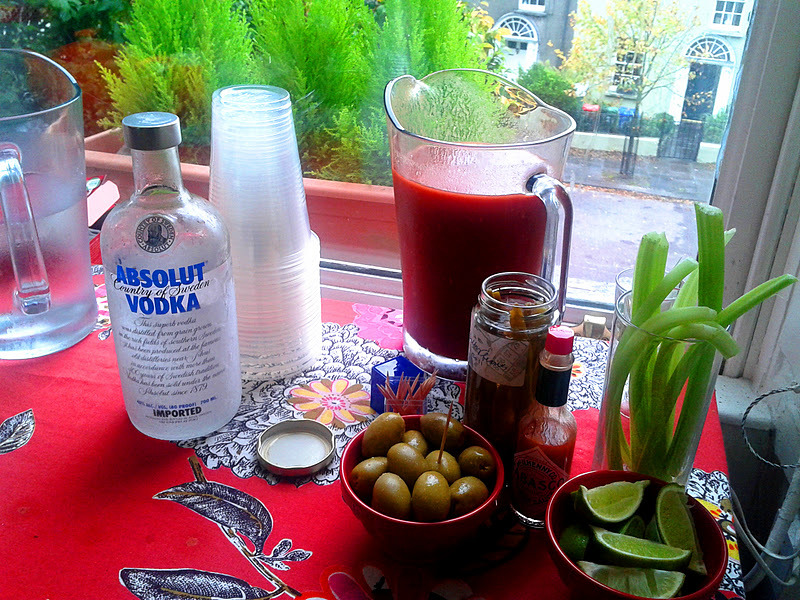 A friend actually had a Bloody Mary Bar at my baby shower and it was very popular. Not with me, I drank the alternative non-alcoholic beverage of the party…water. A true classic. This entry was posted in Drinks and tagged cocktail, mocktail.